By combining the history of the Holocaust in their Social Studies class with literature in their ELA course, students were exposed to primary and secondary source documents and films that built off of each other. From discussions around the Universe of Obligation and questions of “we and they” to reading books such as MAUS by Art Spiegelman and Night by Elie Wiesel, this approach resulted in a seamless flow of conversations between each class. We examined essential questions like, “how did this horrible event come to be?” and tried to answer why people often turn to ideologies of “we and they” in times of uncertainty. Students were no longer studying separate subjects in two separate classrooms. There was an interconnectedness in the curriculum that mirrored what Facing History helps us teach our students: that we - our decisions, the things we do and say - are connected and have consequences, both good and bad. As teachers, we saw our students engaged with the material in a way they hadn’t previously experienced. It gave them a greater sense of purpose in their study. Once they started making connections to their own pasts, we could see the incredible impact it had on them. In a culminating project, students had the freedom to explore any topic related to the Facing History units they studied in their Social Studies or ELA classes. One student chose to write a letter to a relative who had survived the Holocaust, conducting extensive research into this relative’s life, her choices, and the impact those choices had. Another, inspired by the book Salvaged Pages, delved deeper into a young diarist’s life. Some addressed more personal topics, like the student that shared an experience of being racially profiled at the airport, or another, inspired by MAUS, who drew and wrote about a time when he was looked at with fear based on the color of his skin. Teaching the Holocaust and Human Behavior is incredibly important in today’s world. Of course, children should learn about the Holocaust as a historical event, but its importance transcends beyond that. It is critical that students learn about the choices that others made and how they so deeply impacted millions of people worldwide. 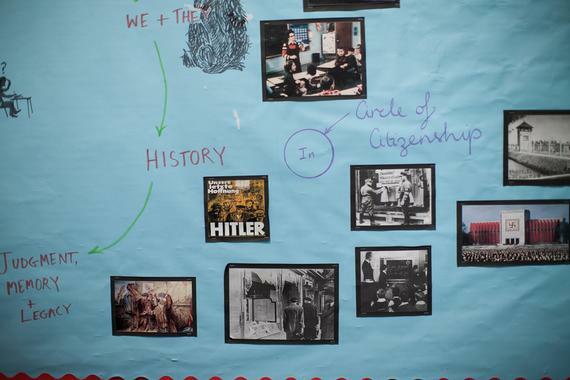 By immersing students in the Holocaust and Human Behavior curriculum in both Social Studies and ELA, students were surrounded with history and literature that bears witness to the Holocaust. They read about and discussed regular people who made terrible choices, and those who made brave, honorable choices. And the story of those people opened students’ eyes and hearts to the truth that their choices matter, too. Explore our resource, Holocaust and Human Behavior, the case study that started it all for Facing History and Ourselves. This fall, we will launch a revised version in celebration of our 40th anniversary. This new edition offers full digital access for educators to a vast array of new scholarship, primary source material, and a wealth of images, videos, and audio never before compiled in a single resource, that are ready for classroom use.